Burberry’s Chief Executive Officer has the distinction of being the highest paid Chief Executive Office in Britain. What makes this news and why should we care? Well, because Burberry’s CEO is a woman — 53-year-old Indianapolis native Angela Ahrendts has an executive compensation package worth 16.9 million pounds, almost 5 million pounds more than the next highest paid British executive, according to the Guardian. At current rates, 16.9 million pounds is more than $26 million US dollars. Pay inequality for women isn’t just at the executive level. President Obama this week celebrated the 50th anniversary of the signing of the Equal Pay Act which was designed to level the playing field for women who often made less than men in the same jobs. Except that 50 years later, women still haven’t achieved pay equity, so I’m not so sure why we’re celebrating. One reason I don’t think we should be celebrating is Rosie the Riveter, the image that represented the women who kept the home fires burning and built airplanes during World War II, who suddenly found themselves without work when the men came home from war. The prevailing attitude among many employers at the time was that women seeking so-called “man’s work” were stealing the birthright of the American male. Many of us know women who “ran the shop” and still made less than male co-workers who did less. Fifty years ago, the signing of the Equal Pay Act was supposed to curb inequalities in the workplace. When I started working in 1979, women made 73 cents for every dollar that a man made, up from forty-some cents when the Equal Pay Act was signed 16 years earlier. Remember how an Enjoli perfume ad suggested young women celebrate women’s progress by bringing home the bacon, and frying it up in a pan? I’m not sure how much bacon those women can afford today, since women who work full-time, year-round make 77 cents for every dollar than a man makes. On his first day in office in 2009, President Obama signed the Lilly Ledbetter Fair Pay Act, which granted rectifications for individuals who proved wage discrimination. The law did not benefit Ledbetter who faced years of wages lower than male co-workers at a tire plant in Alabama. However, the law honors her by legislating penalties for pay discrimination based on gender, age, religion, national origin and disability. But that honor still doesn’t mandate equal pay for equal work. Childless women under 30 had a median salary eight percent higher than their male counterparts in 2010, when women in that age group had more education, specifically a college degree. And according to the U.S. Census Bureau women had a pay advantage over male counterparts, especially if they had children later in their careers, rather than early on. That somewhat positive statistic reflects the only time in life a woman has a pay advantage. Having children is a huge factor for women in making less money over a lifetime than men in the same jobs, according to Joan Williams, professor at the University of California Hastings College of Law, who popularized the term “maternal wall,” the discrimination against hiring or promoting mothers based on the assumption she will be less committed to her job as a result of being a mother. Fifty years after President Kennedy penned the Equal Pay Act, there’s still disagreement about whether it is a good thing for women. While Ahrendts now holds title to the highest paid CEO in Britain, the married mother of three is greatly outflanked in wages by her American male counterparts. Many CEOs in America with higher salaries than Ahrendts, including Ralph Lauren and Abercrombie & Fitch. 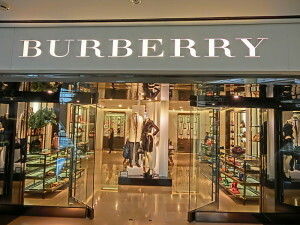 I say “bully for you!” to Burberry’s CEO on her accomplishments because a rising tide indeed lifts all boats. But I can’t help but long for the day when the idea that paying qualified women the same as qualified men is not news, it’s just smart business. And that women business leaders focus on that, as well as their male counterparts. Published on The Broad Side June 13, 2013. Please comment there.